Reigning ISPS HANDA New Zealand Open champion Michael Hendry will have a home course advantage when the inaugural REBEL Sport Masters gets underway at Wainui Golf Club from 11-14 January. Hendry will have the benefit of local knowledge when he tees it up at Wainui, one of the New Zealand clubs where he is currently a member. 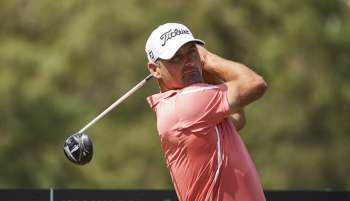 “I’m a member here as well as Gulf Harbour and I live literally about three minutes up the road so it was a no-brainer to play, I’m always keen to support my golf course and New Zealand events as well,” said Hendry. “It’s a fantastic golf course, a great layout but it’s going to be really challenging this week. “It’s a tough golf course in soft conditions let alone in these hard and fast conditions. It’s just one of those things as players we’re going to have to realise; we’re going to get some pretty big bounces at times and they’re not always going to be good ones. The 38-year-old gets the chance this week to add a third national title to his name after winning the NZ PGA Championship in 2012 & 2013, and last year’s ISPS HANDA New Zealand Open where he became the first Kiwi to win since 2003. “Absolutely it would be nice to say you’re a New Zealand Masters, New Zealand PGA and New Zealand Open champion, it’d be a pretty cool trifecta to have,” added Hendry. Hendry, who plays on the lucrative Japan Golf Tour, said he was happy to support the new REBEL Sport Masters which tees off the 2018 ISPS HANDA PGA Tour of Australasia season. The proud New Zealander has also made the decision not to play the WGC – Mexico Championship, where he would be guaranteed at least US$40,000 in prize money, instead opting to defend his title at the ISPS HANDA New Zealand Open. “I always like to try and front up as much as I can on the ISPS HANDA PGA Tour of Australasia, it doesn’t always help with the schedules clashing as much as they do but I love playing my home Tour, I always have,” added Hendry. “For me I don’t only just look at an event like this as good preparation for next week but the Tour, I think deserves, for want of a better term, the better players to play it more often." Following the REBEL Sport Masters, Hendry will contest the SMBC Singapore Open, co-sanctioned by the Asian Tour and Japan Golf Tour, giving him the perfect opportunity to fine-tune his game under tournament conditions this week. “I like to support the ISPS HANDA PGA Tour of Australasia as much as I can and if it can prepare me for bigger events in terms of prize money then that’s great. “I’ve implemented a couple of changes in terms of equipment so whether or not I’m just struggling to get my head around those at the moment, I’m not sure. The REBEL Sport Masters will be played at Wainui Golf Club from 11-14 January, round one begins Thursday at 7:30am local time with Michael Hendry teeing off at 7:50am. Entry to the tournament is free to the public.